Over the past years, having a large amount of teeth replaced was a very lengthy process with a lot of medical and dental appointments that involved long waits and many implants placed in your mouth. 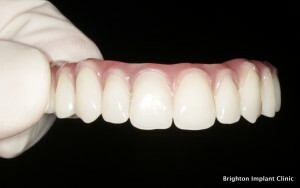 Not until the innovation of All On 4 Implants, this procedure was developed by implant manufacturer Nobel Bio-care and European implant dentist Paulo Malo using bio-mechanics, computer simulation and clinical research. This process uses a minimum of four implants to secure all teeth in place hence, the name All on 4, it provides especially effective restoration of the upper jaw because longer and stronger implants can be secured in the back part of the jaw. What are all on 4 implants UK ? Also known as ‘smile in a day’, ‘teeth in a day’ or ‘same day teeth’ this is one of the most popular solutions available for individuals who want to replace an entire arch of teeth permanently in one day. All on 4 implants UK practitioners are led by the concept behind the procedure, being that only 4 implants are used to support an entire arch of teeth instead of the usual eight to ten implants. This treatment is ideal for those individuals who have been told that they do not have enough bone for implants or that they may need extensive bone grafting for implant treatment. The result is a breakthrough procedure that is safe, cost effective, and allows for high quality full teeth restoration without needing bone grafting. Before the procedure is carried out, the dentist has to properly evaluate the patient’s case where the latter will initially require a consultation and diagnostic appointment in order to best determine the treatment path necessary for the case; this will include x-rays, a CT scan, some impressions, and bone density measuring. There are also systems which allow for detailed diagnostic information such as how much bone is available which can assist in accurate placement and templating for prosthesis sizing. Just after the consultation and evaluation, the patient is scheduled for implant surgery in which the new replacement teeth are fitted and adjusted all in one appointment, including any necessary extractions. After the implant placement, the components that attach the implant to the teeth (abutments) are attached. The replacement teeth are then attached to the abutments with some adjustments to ensure perfect bite and comfort. With only 4 implants total, compared to the traditional 6-8, there is typically a significant time saving and convenience. 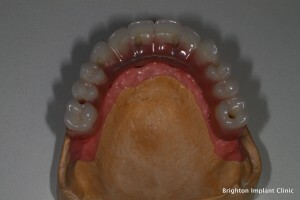 Brighton implant clinic is a group of clinics based in the South East of England. We provide a FREE initial consultation to all new patients. Each of our dentist are trained in dental implant surgery and restorative treatment. We have been established since 2009 and we do our best to provide the best treatment for our patients. 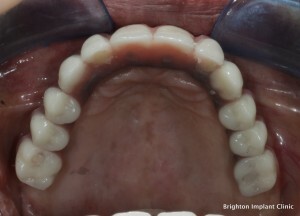 For more information please Contact Brighton Implant Clinic or Call us on 0800 111 6623. And what can be the cost…? I would like to ask if it is possible to have 4 on 4 fitted without having to have anything on the roof of my mouth? Thanks for the enquiry, yes it is possible to have a all on 4 procedure and land up without the roof of the mouth being covered. This is probably one of the best advantages of having a fixed bridge on implants is that the roof of the mouth is not covered by a denture.